I was twelve years old when the first of my three nephews was born. Just old enough to command a little respect from them, I suppose, but not so much older that I seemed completely out of touch. In the early years of my adult life (post-college, newly married, pre-children), I recall feeling suddenly empty and unsatisfied giving them traditional Christmas gifts of Best Buy and Radio Shack gift certificates, model car sets and board games. 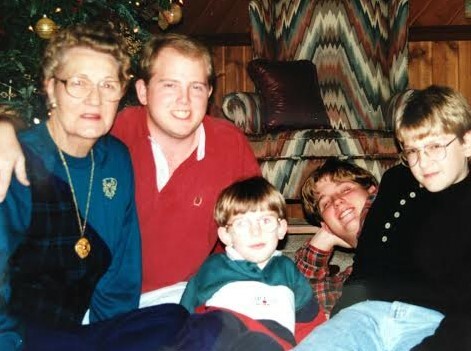 One year, I announced that I’d had enough, there would be no more traditional gift-giving from their Aunt Susie and instead, we’d share a memory, an evening or event spent together creating memories that I hoped would last a lifetime. You’d think they’d be disappointed at their loss of material goods but they were ecstatic! For nearly ten years, we did something different each year. There were sleepovers, laser tag, movies and roller skating. Occasionally, their young cousin Adrienne would go with us and in the later years, my own son joined us in our activities. One year we attended the Winston-Salem School of the Art’s production of the Nutcracker Ballet, where the youngest, Michael had to be repeatedly nudged awake. They still tease me about the year we bundled up in mittens and parkas for a winter hike in the mountains, only to arrive to find our destination closed. We ate our picnic in the car with the defrost set on high. There’s a photo somewhere of the four of us laughing and clinging on the park’s entry gate with the “CLOSED” sign prominently displayed. Today, not a year goes by that we don’t reminisce about those good times. Traditions change. Like many families, our Southern family has expanded into a cultural hybrid that extends to the nether regions across oceans and above the Mason- Dixon line. Eventually, these boys came to our family Christmas gathering with the young women who would become their wives. The girls, of course, having their own families and traditions, brought a new dynamic to the group. Suddenly, our new “family” extended from the country roads of Davidson County to Boston to Greek immigrants from Brooklyn, New York. Well, you get the picture. Sometimes, it’s the years where everything seems to go wrong that are the most memorable, events seared onto your brain with the permanence and burn of a cattle brand. Today, our Christmas traditions continue to evolve. Each of my nephews married the three young ladies they brought to Christmas that year. They are adult men now, with children and families of their own. Except for the year I thought it would be great fun to buy them Christmas underwear as a gag gift to embarrass them with their new brides, I never bought them traditional gifts again but rather began giving them generous bags of my homemade chocolate chips. I’m not sure if they tell me this just to make me feel good, but it seems to be their preferred gift of the holidays. Their new wives began to threaten me in the early years so they now get their own bag of cookies, exactly the same size as their husbands. I struggle to keep the meaning of Christmas alive in the hustle and bustle of the holidays. I share my cookies with neighbors and friends. I treasure the sounds of Christmas: the ringing of bells, change clanging into a Salvation Army pot, the singing of Christmas carols. I love the hugs and greetings of “Merry Christmas” that are exchanged among everyone from friends to strangers. I especially love the quiet that settles upon my household like snow in the days of late December following Christmas when there’s nothing really left to do but watch a movie and take a nap. If you have a family like mine, you understand that’s really something to appreciate! Another great read. Merry Christmas. Susan, you are a very gifted young lady and I enjoy reading your posts. Thank you Barbara. I love writing them. At some point, I keep thinking I’ll run out of stuff to say but so glad that hasn’t happened yet. Thanks for taking time to read and comment. I really appreciate that. Merry Christmas.